In 1937, Grandmaster Benjamin Luna Lema distilled and codified the teachings of generations of arnisadors into a system of knife and stick fighting so fast, so unpredictable, and so easily taught that he named it Lightning Scientific Arnis. 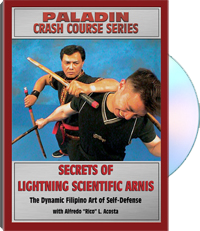 Forged on the anvil of World War II against the Japanese katana, perfected in death-matches where millimeters and microseconds meant the difference between victory and death, the art of Lightning Scientific Arnis (LSA) has never been made openly available to the public - until now. In this truly original video production from Paladin Press, Alfredo Acosta, direct student and authorized representative of Grandmaster Lema, teaches the Thirteen Lethal Strikes of LSA and their accompanying blocks. He then shows you how to combine them with body angling and footwork to yield a series of high-speed flow drills that are guaranteed to burn them into muscle memory. Finally, he teaches the Twelve Fighting Methods: striking combinations and espada y daga techniques that make up the very heart of LSA. Through slow-motion photography and overhead camera angles, this video will provide you with a rare look into a once-hidden martial art. For information purposes only. Alfredo "Rico" Acosta is a 10th-degree black belt in Lightning Scientific Arnis and was personally authorized by the art's founder, Grandmaster Benjamin Luna Lema, to represent and promote the art in the United States. Acosta is also an accomplished practitioner and instructor of other Filipino armed and unarmed martial arts.